What a great day September 10, 2013 was to see the nine companies of 9Mile Labs Cohort I present their business and products to an enthusiastic audience at Seattle’s Bell Harbor Conference Center. Benjamin Romano wrote a great article at Xconomy on the presentations. 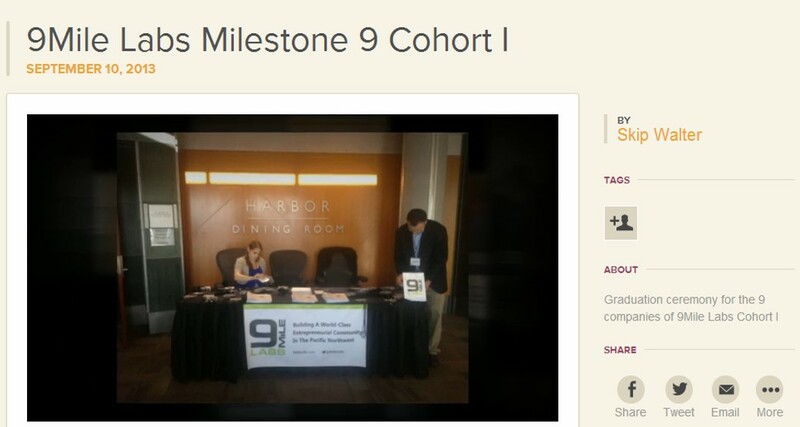 John Cook of Geekwire shared his thoughts on the presentations and companies from Milestone 9. For a quick look at the presenters and the networking interactions check out the video. Thanks to the 9Mile Labs partners (Tom Casey, Kevin Croy, Enrique Godreau III, Sanjay Puri, and Sandy Sharma) for their continuing contribution to the Seattle Startup ecosystem. A special thanks to Kerri Sherwood for permission to use her song “Count on You” from her album As Sure as the Sun. This entry was posted in Entrepreneuring, Lifelet, Lifelogging, Value Capture, Working in teams. Bookmark the permalink.